Brimming with fresh apples and with a hint of cinnamon, this easy cake makes a great pudding served warm with custard, or tucked into a lunchbox for a welcome treat. When I think of Dorset, the coastal county on the English Channel, I think of sweeping beaches, Jurassic fossils and cider. A bit of a generalisation perhaps, but as someone who has never been there – flown over it but not travelled in it – these sound pretty enticing to me. This scenic county is also famous for its apple cake. Searching around there doesn’t seem to be a definitive recipe. However the hallmarks of a typical-ish cake appear to be loads of chunky apples (peeled), brown sugar and a hint of cinnamon. Some cakes are topped with slices of apples that become tantalisingly burnished in the hot oven, while others – like mine – are strewn with amber crystals of demerara sugar, giving a toffee-ish crunch after even the lightest of sugary covering. (I’ve hidden the crunchy top with icing sugar here, but you will see the bare cake below.) The texture can also vary: from spongelike and soft – a Victoria with apples really; to almost crumbly and scone-like, but still soft on the interior, as would be expected from so many melting hunks of apple. I settled on the side of the scone. Not at all dry, mind you. More like a crumb cake really. Dorset for foodies is more than apples, of course. Cheese, seafood and probably some of the most extensive organic small producers in the UK are a must-try for any visitor. If farm shops and farmer’s markets are your thing then Dorset will be your idea of heaven. Some of the best-known UK brands are based in Dorset: ‘The Dorset Famous Five’ – are made up of Clipper Teas, Denhay Farm, Dorset Cereals, Olives Et Al and Hall & Woodhouse. I think I will add award-winning Furleigh Wines to the list. Picking up food from local producers, having a chat to them about the best way to prepare it, and then bringing it back to “my own” kitchen is one of my favourite ways to enjoy a holiday. It is probably one of yours, too. Self-catering is my best option for doing my own thing. And, as you know, I do like to do my own thing. Even with Dorset Apple Cake. I’ve tweaked this to add a bit more fibre and a bit less sugar, but essentially it is a Dorset Apple Cake as you might be served in cafes all over Dorset. This keeps very well for about five days, but I seriously doubt whether it could possibly not be eaten up within this time. You can also make it in a square tin; I do this for work as it makes it easier (for me) to portion out. Enjoy! 1. Preheat the oven to 180C/160C fan/350F. Line sides and bottom of a deep 20cm baking tin with parchment paper. I like to crumple a large circle of the paper until it is soft and push it into the tin. 2. Dry whisk the flour and cinnamon in a large bowl then do one of two thing. First choice is to add the flour mix, butter and sugar into the bowl of a food processor and pulse until it resembles coarse breadcrumbs. Then scrape into a bowl and stir in the egg and milk, mixing until you get a thick batter. The second choice is to add the diced butter to the flour mixture and rub it all together with your fingers until it resembles coarse sand. Then stir in the sugar, followed by the egg and milk. I’ve tried both with pretty identical results. Just don’t go wild with the food processor though; only pulse until those crumbs appear. * You can make this with a gluten-free flour mix too. This is a partnered post. As always, all thoughts, opinions and recommendations are honestly given. Hi…I always enjoy your recipes…they always seem so colorful and wholesome. Could I do this with an egg substitute? Dorset sounds lovely…must do a holiday there sometime. Of course! You could use aquafaba, chia, flaxseed or a bought mix like Orgran. Your photography just gets better and better Kellie. I want to reach my hand in for a slice of that cake. If I didn’t have some rhubarb pie left, I’d jump up and make this right now. Something about apples and pastry gets to me every time. The custard with it? Genius! oh I do love Dorset and this cake is a very special way to celebrate it. I adore that shot of the cake in its tin from above, that’s proper cake! Oh delicious! 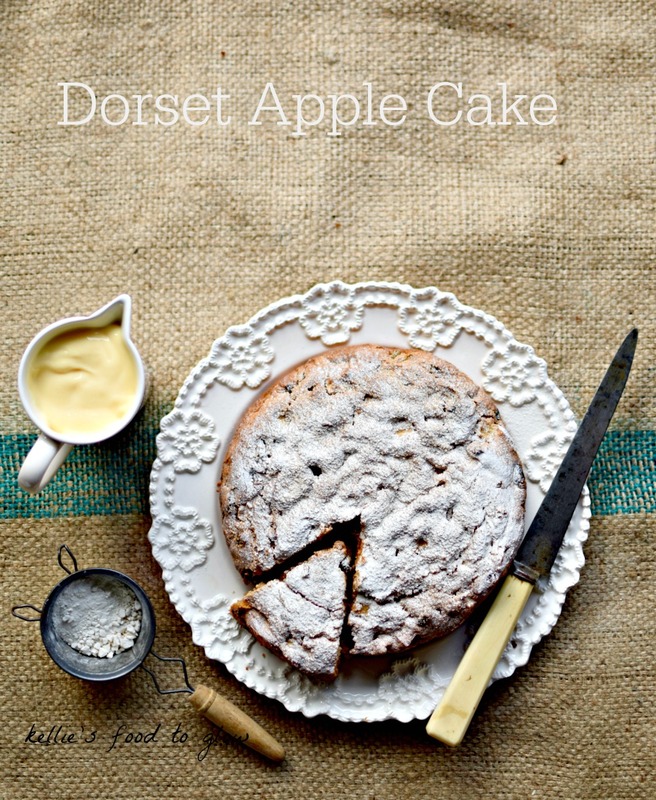 I have never tried (or even heard of) Dorset cake but this sounds yummy! Thank you. I had never heard of it either but when I saw the ingredients and “look” I knew i wanted to make it. And then tweak it, of course! I have always loved a good Dorste apple cake and it is one of those cakes I always forget to make but whe i do it always goes down so well. I think you have mastered this and it seems you really have a talent for baking! Aw, thank you Laura. I bake for work but we don’t often have any for home. Which, when my daughter returns from her European girls tour I will have to rectify. 🙂 Thanks for stopping by. That cottage looks absolutely beautiful… so idyllic and peaceful! Love the recipe too. You can’t beat a classic apple cake! Thanks Emily. And, I go the plate at House of Fraser. This is just the kind of baking I adore… homely, fruity and simple. My family love this style of cake with lashings of custard. Dorset is one of our favourite places to visit… we hired a cottage there for my mother in law’s birthday a few years ago and it was magical! I know, I’d love to stay in it too! Self-catering or a luxury hotel for me. Nothing in between! It’s a doddle to make (not that you need that aspect) and keeps pretty well. I do hope you make it. I’ve made it with Doves gluten free flour mix and it turned out just fine. hi kellie, great looking cake. We always have so many apples from the garden so this would be the perfect way to use them up. Can’t wait to try this out! It looks so delicious. Beautiful photos – you make me want to go to Dorset, sleep in a thatched cottage and eat Apple Cake! Thanks for transporting me to Dorset for a brief minute!